Cultivator: Dalbon. Shown: March 14th. Pricked out three weeks later into 3 1/2" pots with home-made peat/fertilizer compost, 1/2 with Broadleaf P4 added at 1 Kg/m3 and 1/2 without. Photos taken five weeks from pricking out. All treated have well formed flower buds; only about 25% of controls have any buds showing. 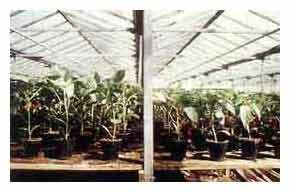 P4 treated pots watered once in every 2 waterings for control. 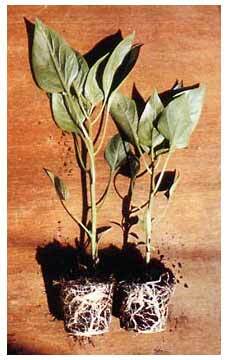 Knocked out of their pots, the Broadleaf P4 treated plant (left), clearly shows a much more robust root development, induced by the polymer and contributing to better top growth, leaf size and color, plus earlier flower formation. The enhanced plant growth and development, seen here, engineered by the polymer, indicates a 10-14 day earlier start to harvesting.